At one time, managing a website meant manually updating dozens of HTML pages or using some type of local site management software like Netscape Composer, Microsoft Frontpage, or Adobe Dreamweaver. There are now a plethora of content systems available that include web-based backends. Pages are now actually dynamic representations of database content, and the market is thick with options. 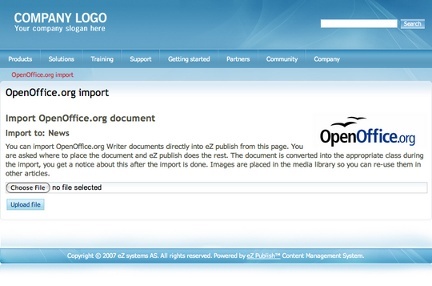 When speaking of enterprise-quality CMS options, a few names come to mind immediately: Joomla, Drupal, and eZ Publish. Voted by many as the number one CMS, eZ Publish is known for its ease of use (as the name implies) and its scalability for small, medium, and major enterprise sites. Some of the major websites now using eZ Publish include: Vogue, Elle, National Geographic, Virgin, and Marie Claire. It includes features such as multiple file uploading, the ability to publish from Microsoft Word, multimedia publishing, and multiple user and site management tools. Best of all, like Joomla and Drupal, eZ Publish is free and open source software released under the GNU General Public License.